In August 2017 my novella A Touch of Magic was published in War Torn: An Anthology in Seven Realms of Fantasy. The anthology had the theme “war” and I chose to take a different approach with that theme and write about “being at war with yourself”. The anthology featured 6 other stories from other international authors (American, Canadian, English and me, Australian). 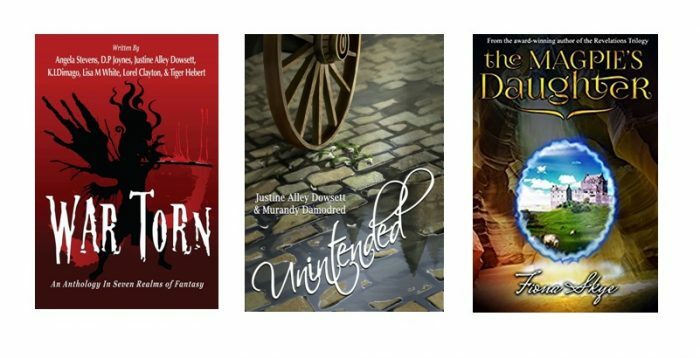 It also featured stories from different sub-genres within the fantasy genre – ranging from traditional high fantasy through to time travel, urban fantasy and my contemporary fantasy. In November 2017 the online distributor the book was published through closed down it’s business and so we (the authors in the anthology) disbanded the anthology. I republished A Touch of Magic as a standalone novella. I’ll do an updated post on where you can find the stories by the other authors later in 2018 (so watch this space). Unintended by Justine Alley Dowsett & Murandy Damodred. This is a fantasy story, with a Shakespearean style twist. It’s both tragedy and comedy and I laughed out loud in the first few chapters when the main character Kenzie en Shareed accidentally marries the wrong guy. It’s a perfectly titled story with a plot that explores the “unintended” theme to the last page. The Magpies Daughter by Fiona Skye I was lucky to read this book as a beta reader. It’s a great story, set in the same world as Fiona’s Revelations trilogy series (I read the first book here), although this is a young adult book, I found it blissfully free of annoying heroines. The story follows Aeryn Walker as she learns about her fae heritage and then enters the fae world. I really enjoyed it.